Has 65,000 miles of beautiful wooded, rocky shoreline. It's clear waters are dotted with many bays, inlets and 14,500 islands which offer you protection and tranquility. The area is sparsely populated. These elements combine to make this a perfect lake for you to enjoy getting away from crowds. The best way to do this is with a Floating Lodges Houseboat Holiday. Your "Houseboat Holiday" offers the maximum fishing time. Sneak off at 5:00 am when the others are still sleeping and catch up on your sleep after lunch. 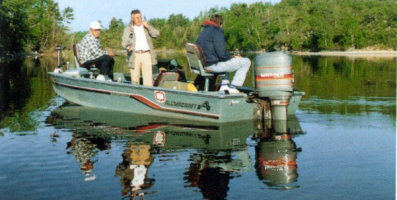 Remember the water, and your fishing boat are only a few steps away at all times. A houseboat trip is perfect for groups with a mixture of avid and less devoted fishermen. Being in good fishing areas allows the avid one to get their fishing in while others are entertained by the multitude of things to do on and off the houseboat. 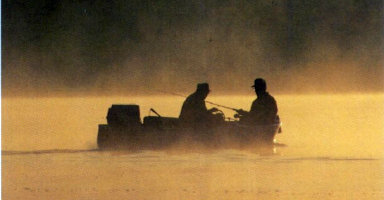 Fish caught on Lake of the Woods are Northern, Walleye, Small and Largemouth Bass, Crappies, Muskie and Lake Trout. Walleye season opens the 3rd Saturday of May, Muskie opens the 3rd Saturday of June, and Bass is Catch and Release only for the month of June. What we do best is run a Houseboat Business. What a guide does best is fish. If you need help in the fishing area, a guide is your best bet. They can be hired by the day or longer. In complete privacy, take your small boat and EXPLORE. Park on a sand beach and picnic, have a shore lunch, explore the woods, enjoy an evening campfire, dive, sail, waterski, windsurf, canoe, bird watch, observe wildlife, paint, photograph, search for driftwood and rocks or pick blueberries and wildflowers in July or August. The choice is yours! And especially enjoy not having neighbours.